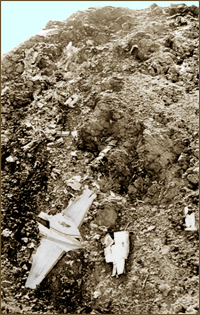 On March 13th, 1974, a chartered airliner rose into a moonless sky and moments later slammed into a rocky outcropping of the White Mountains near Bishop, California. All thirty-six people aboard were killed instantly, including a young actor named Richard P. Ackerman. I first met Rick while building sets at a storefront theater on Hollywood Boulevard where he was performing. He was disciplined, hard working, and a genuinely nice guy. He was also a bottomless well of nervous energy that made the strange characters he played sparkle. His “day job” was selling cosmetics. Sometimes he would arrive for rehearsals straight from meetings with clients. Dash in wearing a business suit, his hair neatly slicked back, perhaps a little uncomfortable that his actor pals would see him looking so dignified. Then, moments later, he would emerge from backstage entirely disheveled, zipper down, one shirt tail protruding bizarrely from the front of his trousers, and his hair a frizzled tangle bristling straight out from the sides of his head. Rick knew how to be very, very funny by remaining entirely serious in the midst of preposterous circumstances. And since that is the essential human condition, he was often wildly entertaining even when he was not on stage. My fondest memory of him is the night he gave my wife and me a ride home from a party in Echo Park, an old hillside neighborhood near downtown Los Angeles. It was late, no one was on the streets, and a copious amount of marijuana had been smoked during the course of the evening. Rick drove a VW Bug. My wife was in the front seat, I was in the back. We turned a corner, the street before us disappeared, and we found ourselves poised at the top of a huge slide. Looking down, the perspective was acute. Street lights twinkled progressively smaller and smaller in converging rows closing in on an impossibly distant end of all existence far below. Rick edged the front wheels over that point where one knows in their belly it is all down hill from here. My wife and I held hands between the bucket seats. We were off. From where I sat, Rick and my wife were silhouettes, as if I was one row behind them at a movie. And the image on the screen suggested we were about to leap to warp speed. But the soundtrack was from another universe. “Cosmetics is mostly about improving appearances,” Rick intoned. “But it’s about scents too. Smells and stuff. My all time favorite scent is what you get when you open a jar of Oil of the Tortoise. No kidding. It’s a face crème with this really delicate scent that’s, you know, a tad unusual. But it’s also really, really… Well, let me give you a sample. You’ll love it. I know you’ll love it. It’s so, so….mmmmm.” The scary, giddy moment was strangely magical. A feeling like falling past blurred wisps of light in a dark, dark sky, while a sweet and funny guy with frizzled hair erupting from the sides of his head rattled on about Oil of the Tortoise.